All I can say is A-mazing! I have to admit I was a doubter the morning I put this together . I didn’t think I had enough liquid and on my way home I picked up Beef Broth but when I walked in the door and the aroma hit me I knew it was right. So right and I am so excited because I used what I had in the house and am delighted with the results. It’s always weird when you’re wearing your pajamas at 8 a.m. , you’re on your second cup of coffee and slicing and dicing vegetables and braising beef cubes on the stove. I doubt I’ll ever get used to that but what a pleasure it is to walk through the door at the end of the day to this!!!! Yum is all I can say. I really did cook for 10 hours. 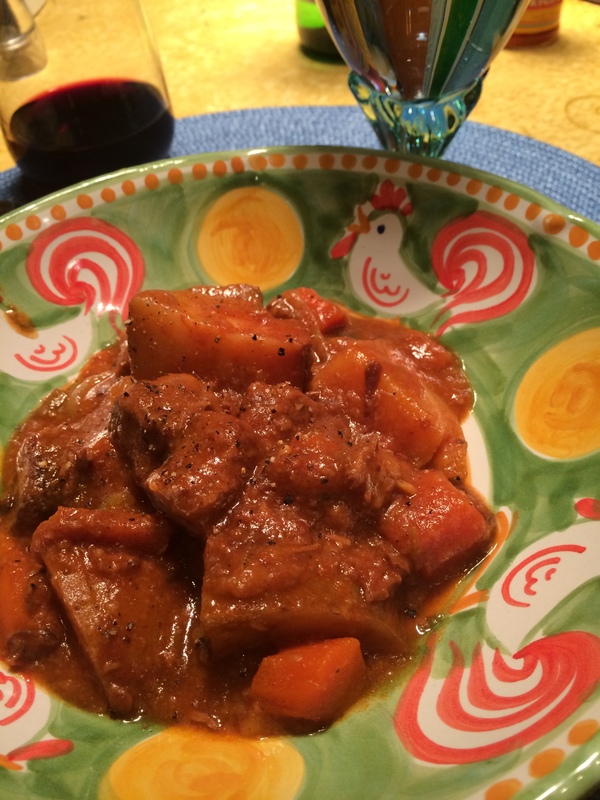 I completed my prep and turned on slow cooker by 9 a.m. and we ate at 7 p.m. 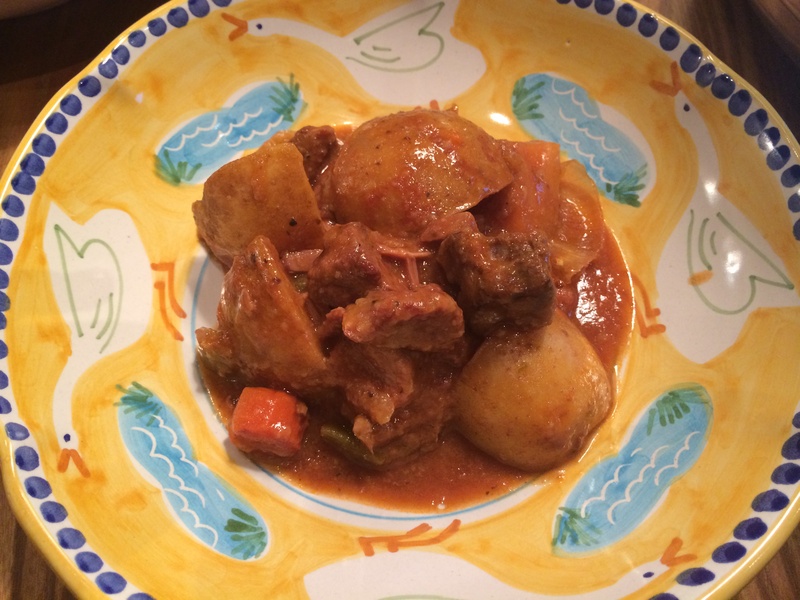 If you’re looking for a more conventional method of Beef Stew, go to my website and enter Sunday Night Stew on a Tuesday Night. This will serve 4 people generously. You can adjust for less people. 4 lbs. stewing beef. ( I buy from the butcher at Whole Foods or at any butcher) It’s usually chuck roast cut into cubes. 4 carrots , peeled and sliced . I like a decent size carrot chunk so cut into decent size chunks. Or you can use baby carrots. ( app. 2 – 3 cups ) and leave them whole. I used red and white potatoes because that is what I had in the house, any potatoes you’d like to use. Peeled or not, I don’t peel. I quartered them. Just don’t make them too small because they will disintegrate. *Beef Broth on hand to thin out if necessary. *2 tablespoons minced fresh rosemary–if you have in the house and want to use it , it adds a great punch of flavor. *you will be searing the meat first, so that’s where I used Salt and Pepper. ( see directions) and it was enough for us. I placed about a 1/2 cup of flour into a shallow bowl and added about a teaspoon of kosher salt and 1/2 teaspoon of freshly ground black pepper. I lightly coated the meat with flour, then dumped out excess flour and prepared my Le Creuset for browning the meat. I heated up 2 Tablespoons of Olive Oil and when oil is hot (not smoking) I added meat in batches to brown them. I had to add a little bit of olive oil to second batch. I put meat on a paper towel lined plate to drain a little bit before adding to slow cooker. Spray slow cooker insert with Pam cooking spray first for easier clean up, then add meat to bottom of slow cooker. Add all of the vegetables on top. In a small bowl, combine the ketchup, wine, Worcestershire sauce, Rosemary and boiling water. Pour over the meat and vegetables. Cover and Cook on LOW for 8 – 10 hours. You really don’t need noodles or rice with this because you have the potatoes. If you’d like omit the potatoes and serve over rice or noodles. Your choice. I served in large shallow bowls. A nice crusty bread would be nice served alongside to sop up the sauce. 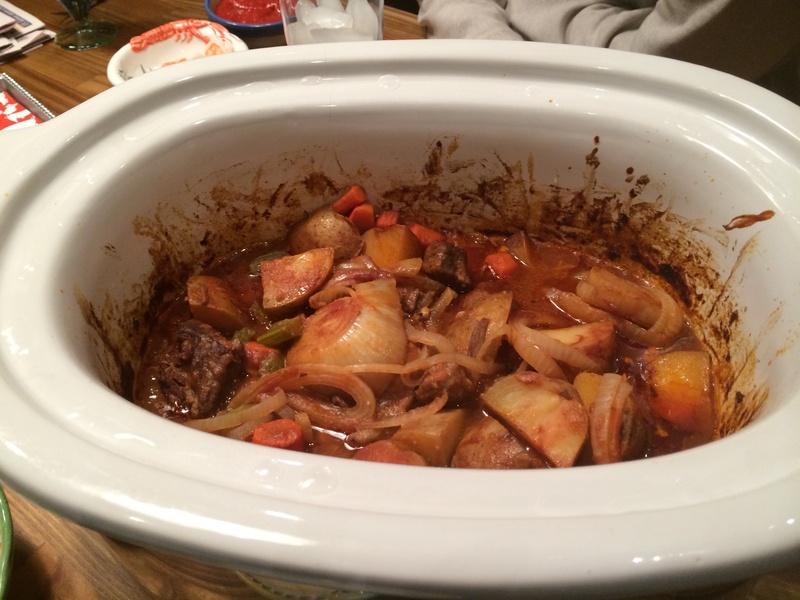 This entry was posted in meat, Sauce, slow cooker and tagged Beef Stew for 10 hours, Slow Cooker, Slow Cooker Beef Stew. Bookmark the permalink.